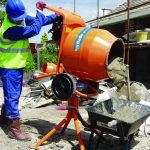 Because of the small size and light weight of this mixer, it can be moved easily through doorways and around the site. Although it is small, it can still mix 85 litres in 6 minutes. Complete with stand with tilting capabilities, the contents can be emptied with little effort. 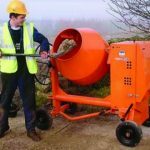 This reliable diesel powered cement mixer can mix up to 110 litres in just 6 minutes. The heavy duty large wheels make it easy to manoeuvre and the wheel operated tipping makes emptying it painless.